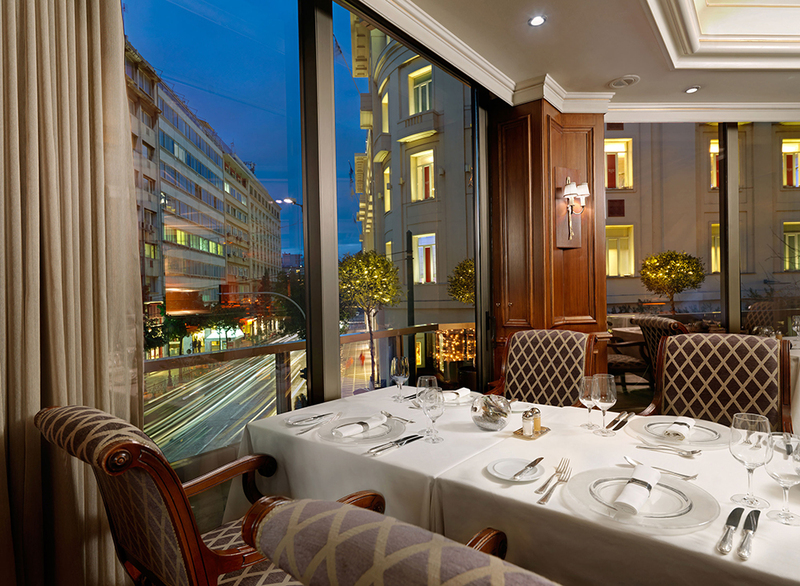 Our hosts, Mrs Aphrodite Arvaniti, the hotel director and the Chef himself gave us a very warm welcome at the restaurant – a very elegant place, in the heart of Athens. Whilst I was enjoying another sunny autumn day, gazing down at busy Athens, my taste buds were on alert. I was about to taste a very special menu. Nikos Giannopoulos has linked his career with the menus of Athens Plaza. Over 25 years, he has been creating dishes using the best of Greek ingredients with French techniques. The result is simply exquisite: French finesse taking Greek culinary heritage to new heights. But how can Greek cuisine be gourmet? It’s true that Greek cuisine is associated with its simple, hearty ingredients, motherly cooking and rustic dishes.You might think of it simple and unaffected Greek dishes walking the red carpet, posing next to its haute-cuisine cousins. It takes a lot of craftsmanship to do this well and Nikos has created an exceptional menu of culinary experiences. I had traditional fava (split-peas puree) with octopus and hearty black-eyed bean salad topped with very thin slices of “louza”, a traditional cured pork fillet from Mykonos alongside French duck and perhaps the finest of onion soups. Then there was a simple fish soup inspired from his travels to Mani paired with a classic sole meuniere. Nikos was trained to cook in France and as any creative person does, he went ahead and created something greater. He “married” the very French mache with anthotyro, a delicate Greek cream cheese rolled in crunchy ground pistachios from Aegina. He combined steamed mussels with humble marinated anchovies on beds of fresh lettuce. He even added his childhood memories to the menu by perfecting one of his mother’s favourite recipes: a rustic goat roast, cooked slowly in an herby yoghurt sauce with dill and fennel. I felt very privileged to have a chat with the Chef at the table. He took me through his dishes one by one with the care of a man who truly loves his work. He pointed me towards his pork tenderloin scallops with nettle pesto and mustard seeds placed on mushroom puree; grouper fillets poached in traditional Greek herbs, Mediterranean hartwort and lemon verbena. I was truly bewildered by his creations! As for his 25 years in Athens Plaza? He had never imagined he would become Executive Chef at the Parliament when he started out. He confided in me saying that: Athens Plaza is my home; after 25 years I cannot think of a more inspiring place to be. When his favorite dish was served, a lobster and artichoke fricassee, juicy and delicious I was lost for words! May Nikos Giannopoulos celebrate many more creative and delicious years at the Athens Plaza. If you are visiting Athens, make sure to put Athens Plaza on your list. There is definitely a very special menu waiting for you, lovingly prepared by Nikos and his team. Oh my absolutely scrumptious menu! Lucky you Eugenia! All sounds delicious.I especially like the look of the pumpkin soup. I really like a good soup. Thank you for the tantalizing photos. I need a snack now.